Being born again and coming into the consciousness of salvation is not the end for us. The Spirit of God wants us to go further. He demands that we come into the full understanding of what destiny is. Whether we know it or not, every one of us has a destiny, and our responsibility as believers is to recognize it and to make destiny our focus. We are given calls, dreams, and assignments, and we must begin to function in these areas. 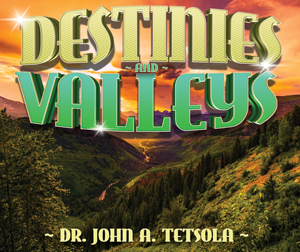 As we pursue these destinies we will experience both mountaintop experiences and valley experiences. None of us like or look forward to valley experiences in our lives, but they cannot be avoided. Unfortunately, many believers truly believe that God is the God only of the mountains, but we must always remember that God is not just the God of the mountains but also of the valley.